The temple celebrates the birth day of Chandeswara Nayanar in the month of Thai (January-February) on the Uthiram star day. Lord Shiva blesses the devotees as a Swayambumurthy. 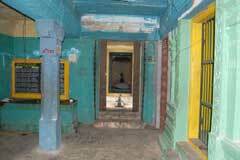 This is the birth place of Sri Chandikeswara who blesses the devotees in all Shiva temples. Lord Bhairava’s shrine is in the Maha Mandap, which if tapped produces a bronze metal sound. Sri Satyagireeswarar Temple, Senganur-612 504, Tirupanandal post, Tiruvidaimarudur Taluk, Thanjavur district. As a small piece of Meru Mount fell at his place, the temple is built appearing as if on a hill facing east. This is the one of the Mada temples built by Chola king Kochenganan. The temple has two prakaras, one at the top and other at the ground. The sanctum sanctorum, Artha Mandap, Maha Mandap are in the hill top. The shrines of Lords Nataraja, Bhairava, Vinayaka, Muruga, Mother Gajalakshmi and Chandikeswara are in the prakara. If one taps the wall in Mahamandap, he/she can hear bronze metal sound. Any one facing any adverse situation in life, may submit their prayers to Lord. Devotees offer vastras to Lord and Mother and contribute to the renovation of the temple. The place has twin reputation. 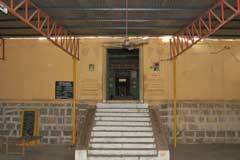 1) Of the 63 Nayanmars, this is the birth place Chandikeswara with Easwara title-Chandikeswara. 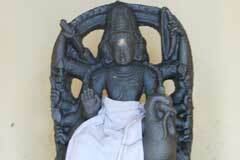 He graces in the temple in Arthanareswara form. 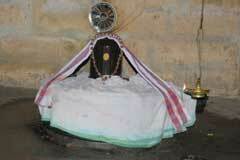 Tiruvaipadi nearby is the place where attained salvation. He appears majestically as Lord Shiva Himself with crescent moon, long hair, Kundalams (ear rings) and the holy Ganga on the head. Emperor Shibi, King Harichandra had worshipped Lord in this temple. 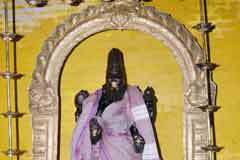 Saint Arunagiriar had sung the glory of Lord Muruga of the temple in his Tirupugazh hymns. Epic poet Sekkizhar had beautifully described the reputation of the temple in his Peria Puranam. This is one of the important cities of Chola kings. 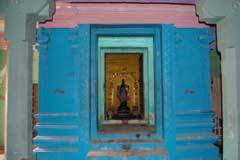 2) This is also the birth place of Acharya Priavachan Pillai an eminent scholar in Vaishnavite philosophy. He has authored elaborate commentaries on Naalaayira Divya Prapandam singing the glory of Lord Vishnu sung by the great 12 Azhwars. Among his works, the Divya Prapandha Ramayanam, picking up suitable lines from the prapandham is chanted by devout Vaishnavas as Nitya Parayana. It so happened that Brahmma was punished by Lord Muruga for not knowing the meaning of Pranava Mantra. This led to a difference of opinion between Lord Shiva and Muruga. To meet the Father’s challenge about his proficiency in the Mantra, Muruga had to act as Guru and Shiva as a disciple. The incident caused dosha to Muruga. He came to this place, created a spring and worshipped Shiva and got relieved of the dosha. Also, on His way to destroy demon Surapanma, Lord Muruga worshipped Lord Shiva here and got the weapon of Rudra Pasupatha missile. Divine sculptor Deva Thachan built a great city here for Kumara (Muruga) the place was named Kumarapuram then. 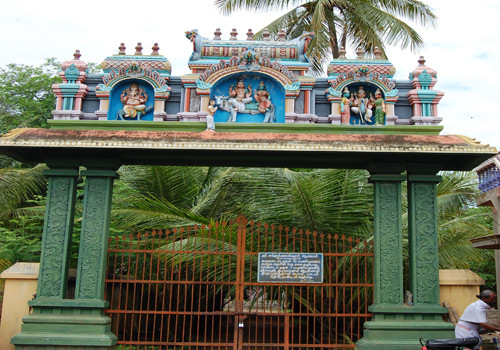 As Child (Sei in Tamil) Muruga worshipped here, the place is also known as Sei Nal Oor-Seignalur. There is big shrine for Muruga in the temple. In the contest between Adisesha and Vayu regarding their prowess, the former held the Meru Mount tightly. Vayu blew violently to break the mount. A small piece fell at this place. Hence, the place was named Satyagiri. Visara Saruman is the son of a Brahmin Echa Thathan and Pavithra. His holy thread ritual-Upanayanam- took place when he was seven as per vedic order. Visara Saruman spent his days in the devotion to Lord Shiva. He was the shepherd to the cows owned by the Brahmins of the place. 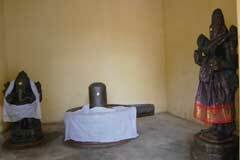 He also made a Shiva Linga of the sand of Manniyaru River and used the milk of the cows for abishek. Even after offering enough milk to Visara Saruman for his puja, the cows still gave full quantity of milk to their owners. Knowing this, the Brahmins complained that he was wasting the milk meant for Yajnas. His father too joined the opposition. While Visara Saruma was deeply engaged in his Shiva Puja, his father not only attacked the son but upset the milk pots. In his deep concentration on Shiva puja, not knowing that the assailant was his father, he returned the attack with a stick which turned into an axe and cut his legs. Lord Shiva appeared before Visara Saruma with Mother Parvathi, honoured him with His Kondrai garland and said, “As you have now lost your father, I shall be your father henceforth” and offered the title Easwara – Chandikeswara. Scientific Based Lord Bhairava shrine in the Maha Mandap in the temple produces a bronze metal sound if tapped on its wall. 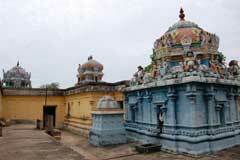 Senganur, 16 km from Kumbakonam on the Chennai route is near Tirupanandal.